With 1300 years of history, an English King, 2 Saints and now one of the Great Gardens of the World. 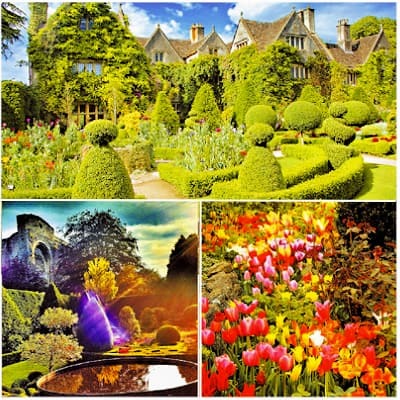 Where the Cotswold meets the West Country, featured on many TV programmes this truly spectacular 5 acre garden beside the 12th century Abbey Church in the centre of Medieval Malmesbury and straddling the River Avon has brought praise from around the world. Words used to describe it range from Unique, Unforgettable, Magical, Paradise, Heaven on Earth, through to ‘This garden alone made my visit to the UK worthwhile’, ‘The loveliest truly English garden on the planet’, ‘A real national treasure for the future’ and from Alan Titchmarsh “The WOW factor is here in abundance!”. The spirit of the place shines through and could be the best garden visit you ever make. We have over 2000 different roses (largest collection in the UK) and over a 1/4 million of tulips. Group Rates: Minimum Group Size: (12+). Tours/Events: Plays, Demonstrations, Sculpture and Exhibitions. Also licensed for Civil Marriage/Partnerships, See website for additional information. Location: In Malmesbury town centre. Off A429 between M4 junction 17 (5miles) and Cirencester (12 miles). Coaches drop passengers in centre of town, 3 minute level walk from garden. Cars follow signs for long stay car park from Malmesbury town centre. Garden is 5 min walk across the bridge, up the Abbey steps and entered left of Cloister Garden.